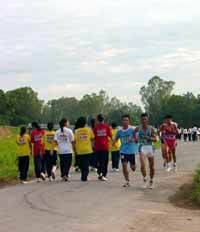 Thousands of marathon runners participated in Ra Pi Day Mini Marathon on August 2 celebrating the Thai Law Day. 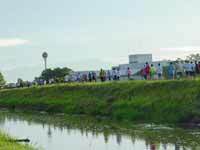 The marathon started from Chiang Mai City Hall at 6 a.m. and the route went alongside the irrigation canals and turned at Huay Tueng Tao Public Park, back to the City Hall, and back to the starting point. The distance was 1.5 kilometers. Marathon runners pass in opposite directions, the first group can say hello and goodbye to the tail-enders. The Kromluang Rajaburidirekrit Foundation organized the mini marathon celebrating Ra Pi Day and to venerate the memory of Phra Chao Kromluang Rajaburidirelrit, the father of Thai Law. Over 60-year-olds enjoy running, too. Department, Probation Office and lawyers. Every athlete was given a finishing certificate and memento. Money raised from the event will be going to charitable projects under the foundation’s objectives. 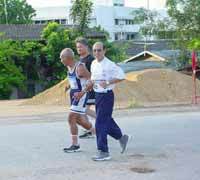 Lampang Provincial Tourism, Sports and Recreation Promotion Center, Lampang Provincial Administration Organization and Sports Authority of Thailand, Lampang, will jointly arrange the first Lampang Aerobic marathon on August 10. 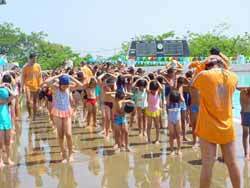 This will take place at Kelang Nakhon Public Park. Next to the irrigation canal. Sompong Fuangraya, the director of the Center, said the marathon is being held as part of a public awareness policy to promote exercise and playing sports for recreation or hobbies. 13 districts in Lampang Province will take part in the event which will include novelty races, look tung golf, and other local games. These will be contested as overall champions, men and women as well as family four-member teams, and ten-member teams from the government offices. The event will commence at 1 p.m. For those who would like to be involved, contact the Center tel. 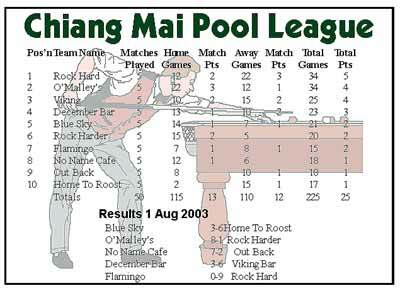 (054) 226919 or the Sports Authority of Thailand, Lampang, Tel 054 223048. The Chiang Mai University (CMU) Cup has been won by the host CMU team, defeating Provincial Electricity Authority in a thrilling 1-0 match. Eight teams took part in this tournament from Chiang Mai University, Mae Jo University, Payap University, and Yonok University in Lampang, Rajabhat Institute of Chiang Mai, Mae Hong Son Provincial Division 2 team, Provincial Electricity Authority team and PT Sports team. The final rounds were played at the CMU main stadium. The preliminary final for the third place was held between Payap University and Chiang Mai Rajabhat Institute, with Payap claiming the third spot with a 4-1 win over their opponents. The grand final between CMU and Provincial Electricity Authority team was very close with a nil-all result at full time. However, in the first minute of injury time, CMU scored to take the final 1-0. Insom Panyasopa, president of Northern Press Association of Thailand, presented the awards at the completion of the event. The next competition will be the 31st Thong Kwao Games to be hosted by CMU at the beginning of next year. The KFC-Pizza Hut-Pepsi team is competing in the Asia Cross country Rally 2003 from August 8-14 running from Bangkok to Malaysia. Many professional drivers from Thailand are participating in the event including the last year’s champion of the Asia Cross Country Rally, Rachan Trairat and Sakchai Hantrakul, a racer with much international experience. Chiang Mai Mayor Boonlert Buranupakorn presided over the opening ceremony. Don’t worry, the gun hand blanks in it. Entries have been received from more than 50 Asian teams from many countries including Japan, Korea, Taiwan, Malaysia, Taiwan, and Thailand. On August 2, there was a parade around Chiang Mai to show some of the cars which will participate in the rally this year. Boonlert Buranupakorn, Chiang Mai mayor presided over the ceremony before the cavalcade moved out. Trans-national vehicles at the ready before the parade in Chiang Mai City. Panitarn Sethaputra, the director general of Thailand and Indo-China Yum Restaurant International (Thailand) Co., Ltd. said that KFC and Pizza Hut want to sponsor Thai racers up to international classes. Rachan Trairat, the former Asian Cross Country Rally champion, signals he is ready to go. He also invited teenage motorbike riders to join in the fun. Sakchai Hantrakul confirmed that the vehicles and the drivers were completely ready, while Rachan Trairat invited teenage motorcycle riders to join the racing tournaments in Chiang Mai. “I want to invite the teenagers who love to race on public roads to instead join the legally arranged racing tournaments which are frequently organized in Chiang Mai. Participating in rallies is fun and challenging,” said the Asia Cross Country Rally former champion. On Mother’s Day, August 12, the 700 Years Anniversary Sport Complex will organize free exercise between 8 a.m. & 8 p.m. to celebrate H.M. the Queen’s birthday. Sports lovers are invited to use the 700 Years Anniversary Sports Complex free during H.M. the Queen’s birthday celebrations. Boontan Muangchuen, the director of Sports Authority of Thailand, Region 5 Chiang Mai said that the 700 Years Anniversary Sports Stadium will open for swimming, tennis, aerobic dance, badminton, shooting, gymnasium and outdoor sports. There will also be a 50% reduction in fees every Tuesday during August through to September this year. For additional information, contact the Swimming Pool Building of the 700 Years Anniversary Sports Stadium during the day or call 053 210 825, 053 219 495. The Ice Hockey Association of Thailand is running an ice hockey training camp for young sportsmen aged 14-16 years old at Bully Sky Ice in Kad Suan Kaew Shopping Complex, and at Chiang Mai Orchid Hotel. The camp starts today, August 9, and skates through to lucky August 13. Over one-hundred participants from 6 countries are taking part, including puck passers from Chinese Taipei, India, Mongolia, Hong Kong, Singapore and Thailand. This course should help them improve their skating skills and teach them the proper regulations of the game. The Mae Jo University Golf Club has scheduled a golf competition for the seventh Mae Jo Cup on August 10 at Chiang Mai Lamphun Golf Club. There will be two sets of tee times, one in the morning and one in the afternoon. Lot’s of big prizes will be up for grabs, including cars, motorcycles and gold necklaces. Where do I sign up? To find out where you can sign up and for more information, please ring 053 221 911. Hares: Dirty Pervert and Twin Peaks. If you like lamyais this was the run for you. Zillions of the little ripe and juicy suckers were out there waiting for us. Dirty Pervert and Twin Peaks had set up a carpark in a very scenic area opposite a temple at Ban Thi. We ran up the track opposite the temple into the lamyai orchards beyond. We were soon lost, sometimes too much paper, then no paper, everyone running into each other from different directions, beating our heads to pieces on clumps of hanging lamyais. Daglocks and Superman thought better go back to the last clear check and try again another direction. This worked and the only problem was passing Bone Collector, Misfortune and other people sitting on the trail munching lamyais. We eventually cleared the orchids and came up to an irrigation canal. Could see Wombat, [email protected]#* and others disappearing along the canal west into the setting sun. I smelt paper the other side but couldn’t see it. Then X-Virgin Sister, Super B and Smiling Oyster swept by us, this was becoming embarrassing. Better catch up. A bit further along the canal we saw Better Knot crawling on hands and knees on the other side heading back. Was he sniffing for helpless sheep in that long grass? Mate, no, you’re supposed to call On On, so the slow runners can take advantage of the loop. Then we got stuck again on another check. While I looked for a trail up on the hill On On was called back on the canal again! Returned to pass Who The Hell is Bob, good walking mate. A nice loop into a small forest caught out leaders Bone Hur, Better Knot and [email protected]#*. Around the bottom of a hill to another canal going zonks to the north. We were smarter this time and let the FRB’s disappear far around the corner before finding the paper on the other side. HP joined us and we ran in, somehow DC was already there. Thanks DP and TP, loved the lamyais.